Chair massage practitioners and massage therapists have a passion to help people and make them feel good. It's a very rewarding career in that aspect, however most are not very successful from a financial perspective. According to a 2003 Collis and Reed report, a research company commissioned by the College of Massage Therapists of Ontario, 39.9% seek out massage therapy for relaxation purposes only. Here are their findings when they asked, "Why do people seek out massage?" And how frequently did those people get treatment from their massage therapist? This is fantastic news for Chair Massage Practitioners and Massage Therapists! 85.8% of that 40% population seek out relaxation massage at least once per month. 60% of the public are waiting for you to provide your solution to help them relax. So if you're not meeting your financial goals, it's certainly not from a lack of potential clients. Don't suffer from unnecessary frustration and anxiety trying to build the practice of your dreams. If you have limited knowledge in marketing, sales and running a business, you've sought out the right place. Learn the skills you needed to develop your chair massage business into a model of entrepreneurial success. 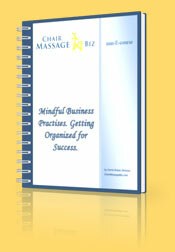 Chair Massage Biz offers you the expertise to to create your dream business. When you are ready to take action and launch your business, through the many stages of development, Chair Massage Biz e-courses will light the way to your success. These well proven e-courses will not only provide general information and basic marketing theories; the bulk of your success will come from e-courses that have a very specific focus with information, trade secrets, and samples of marketing materials based on successful real life experiences. Each of these specific e-courses provides you with the tools you need to market yourself to specific niche markets. Chair Massage Biz marketing e-courses will help you explore your thinking and expand those thoughts into thoughts of success and freedom for you and your family. Get the knowledge for the road to success, and avoid making the mistakes of other practitioners. These upcoming e-courses will be rolling out over the next few months at unbelievable prices to ensure they are accessible to everyone. Let us know what you are struggling with, what questions you have. Chair Massage Biz is here to help you grow the business of your dreams. Chair Massage Biz is an action based focused. To succeed you must take action. The time to start is now. Sign up for free monthly newsletters, send us your tips, ask the expert. Success comes when Desire, Knowledge and Will come together. Make sure to subscribe to the FREE "Chair Massage Business" Newsletter by entering your name and email address below. You'll get access to lots of great information to keep you up to date in the world of chair massage, and you'll be the first to know when new resources and e-courses become available.